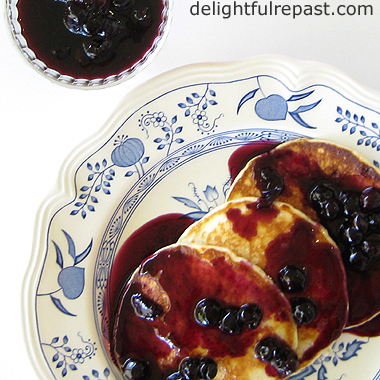 Homemade blueberry syrup on pancakes or waffles is one of my favorite "breakfast for dinner" meals (since I rarely eat anything but fruit, nuts and oatmeal for breakfast). But it can't be phony, store-bought blueberry syrup, in which blueberries are a distant third on the ingredient list, after high fructose corn syrup and corn syrup. I can't remember the last time I ingested either of those things. Not being a food snob, just trying to take care of my health. Which is why I also do not use artificial sweeteners and limit my intake of sugar and other natural sweeteners, such as honey and maple syrup. 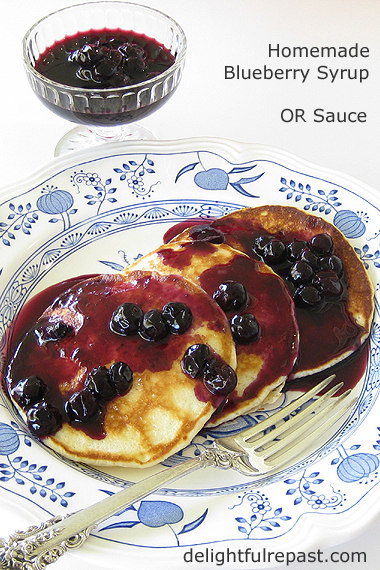 I use just 2 tablespoons of real maple syrup to make 1 cup of blueberry syrup. A cup of the blueberry syrup is enough for 12 5-inch pancakes. So, to do the math (which I always do, in order to stay within my daily sugar allowance): 1/4 cup of my homemade blueberry syrup, perfect for 3 5-inch pancakes, contains just 1 1/2 teaspoons of real maple syrup (sugar). To read how I, a comfort food blogger and frequent baker, handle sugar in a way that is realistic for me and doable for the long term, read Sugar - Toxin or Treat? And here are my recipes for Pancakes, Gluten-Free Pancakes, and Waffles. You can also use this as a sauce on desserts. What do you like to put on pancakes and waffles? 1 Put washed blueberries in 1-quart saucepan. Add maple syrup, 3 tablespoons of water and tiny pinch of salt (don't overdo it!). Bring to boil over medium heat; lower heat and simmer for 8 minutes. 2 Stir cornstarch into remaining 1 tablespoon water, and stir into blueberries. Simmer for a minute or two. 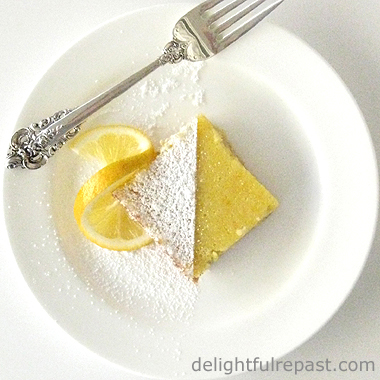 Remove from heat and stir in lemon juice. 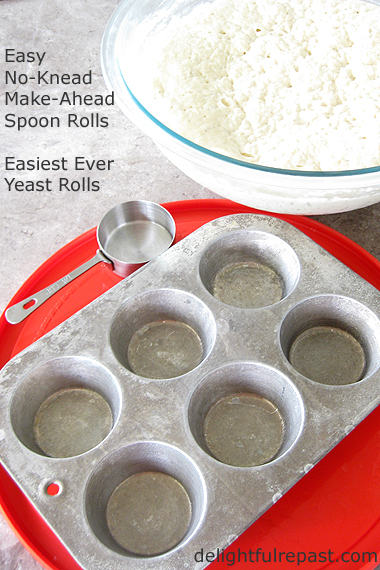 Spoon rolls are the easiest yeast rolls ever. When I'm feeling my Southern roots from my paternal grandmother, I like to make her delectable fried chicken dinner with mashed potatoes and cream gravy, green beans, biscuits, peach pie and iced tea. Now there's a Delightful Repast! Spoon rolls are a Southern thing, too, but I just have to have biscuits with my fried chicken. Other dinners, give me a yeast roll. 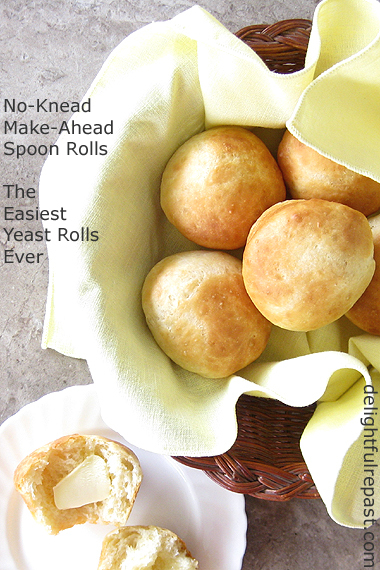 Traditional spoon rolls are the quickest and easiest yeast bread going. The problem I always had with them was that, though tasty, they were more like a muffin in texture. So several years ago I started experimenting and came up with a much more flavorful version that has the proper yeast dough texture. Still just as quick and easy, but since they have to hang out in the refrigerator for at least 24 hours, you have to plan ahead. 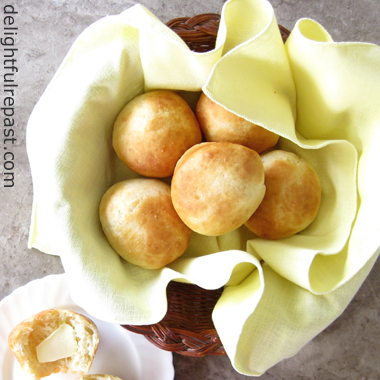 So next time you want dinner rolls but don't have the time or inclination to make Pull-Apart Dinner Rolls, try my 24-Hour Spoon Rolls, so called because the no-knead dough needs at least 24 hours in the refrigerator. 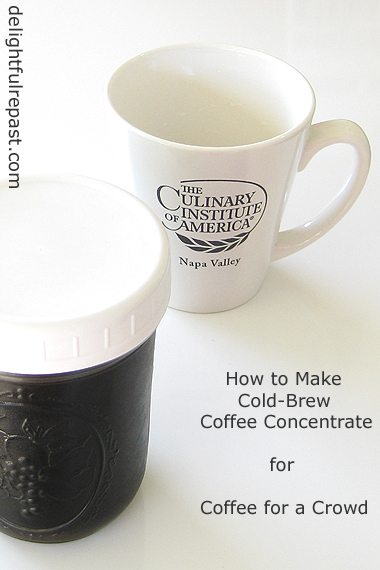 You can even leave it in the refrigerator for several days, so this is a wonderful make-ahead thing for busy cooks. You can have freshly baked dinner rolls every day! You don't have to bake 18 rolls if you don't need that many. Bake 9 one day and 9 another day, or 12 today and 6 the day after tomorrow, whatever you need! 1 In large bowl, whisk together flour, sugar, yeast and salt. In small saucepan, melt butter; stir in water. With dough whisk or large wooden spoon, stir water, melted butter and beaten egg into flour mixture until blended. The dough will be very sticky. Cover with lid or plastic wrap. 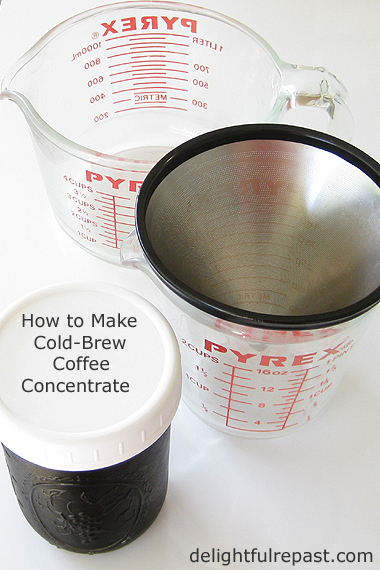 Place in refrigerator for at least 24 hours or up to several days. 2 An hour to an hour and half before serving time (the longer time if your kitchen is cold), remove from refrigerator and stir down the dough (just a few strokes). With a 1/4-cup measure, scoop dough into well-greased or cooking-sprayed muffin tins, filling two-thirds full (scant 1/4 cup). 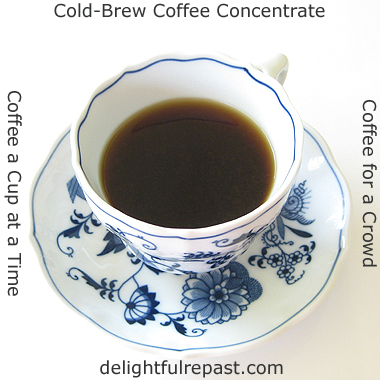 Let rise, uncovered, about 30 minutes (60 minutes if kitchen is cold) or until they’ve risen to the top of the cups. During last 15 minutes, preheat oven to 400F/205C/Gas6. Note: I have a couple of very old 6-cup standard muffin tins as well as a 12-cup muffin tin that comes with a lid. 3 Bake for 20 minutes or until rolls are golden brown. Let stand 5 minutes before removing from tins. Makes 18. 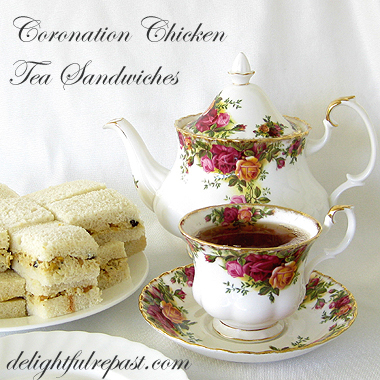 Coronation Chicken Tea Sandwiches popped into my head this week, mainly because I wanted an excuse to use my new tea set. Our dear friends in New Mexico came for a visit and brought me their Old Country Roses tea set, something they no longer use, having gone over to the dark side, coffee! Like me, these friends run a tight ship - and do a far better job of it than I! They don't like to have unused things cluttering up their cupboards or garage. So Julia asked me before they left home if I'd like to have the set. But of course, darling! But it meant making a place for it by getting rid of at least as many pieces. Several days before they arrived I boxed up the teapot and other items to be donated and said goodbye to them. They were all things I liked, but not as much as I was going to like the Old Country Roses tea set and thinking of our friends every time we use it. 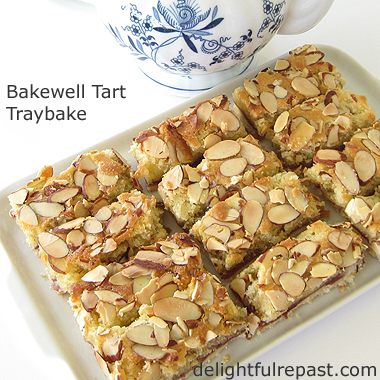 I don't have the time or energy just now for a tea party, so I just made some sandwiches and tea and pulled some Bakewell Tart Traybake squares from the freezer. Didn't make Scones, which is a shame since I also have a jar of my homemade Clotted Cream in the freezer. Many recipes for Coronation Chicken call for Major Grey's chutney, but I don't always have that product on hand. Certainly didn't want to buy a jar (and have most of it go to waste!) just for a small batch of Coronation Chicken. So I just used some of the chutney ingredients in my recipe. Are you a Coronation Chicken fan? When it's made with chutney, it's much too sweet for my taste. But made my way, I really like it. 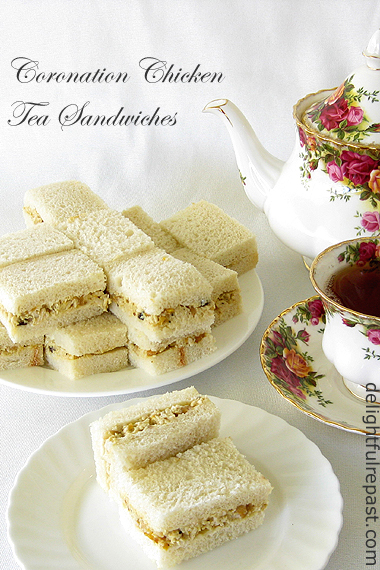 What is your favorite tea sandwich? Update 05/30/18: I just discovered Fallue - The Traditional Norman Brioche, which is the perfect bread for these sandwiches! 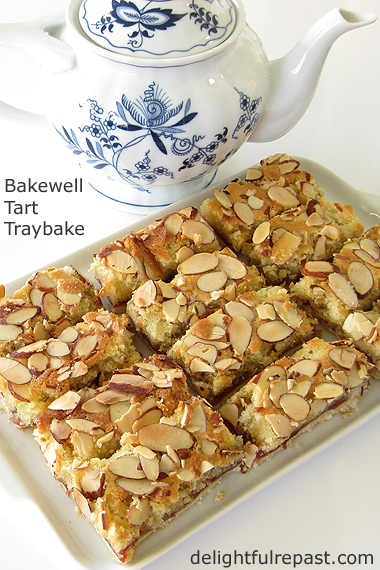 1 In dry skillet, toast the almonds over medium heat, stirring frequently. Remove to bowl to cool. 2 In same skillet, still hot, heat the olive oil. Add the chicken breasts and cook, loosely covered, over medium-low heat about 15 minutes on each side, depending on the thickness of the pieces. Season each side of chicken with 1/8 teaspoon each salt and pepper. Remove to plate to cool. 3 Add onion to skillet and cook until very soft, about 5 minutes. Stir in dried fruits, curry powder, dry mustard, red wine vinegar and apricot preserves; cook over low heat for about 3 minutes. Remove to bowl to cool. 4 Chop the cooled toasted almonds and put in a 1.5-quart bowl. Chop the cooled chicken and add it to the bowl. Stir in the onion-dried fruit mixture. Stir in the mayonnaise and lemon juice. Taste and adjust seasoning. Cover and chill for at least an hour before assembling sandwiches. 5 Spread each slice of bread thinly with softened butter. Divide the chicken salad (about 1/4 cup each) among the 8 bottom bread slices. Top with remaining buttered bread slices. Trim off crusts and cut each sandwich into four fingers or triangles, arranging on a plate in about three layers. Being half Southern (on my Daddy's side), I always called my father "Daddy." Anyway ... Daddy made a great broccoli salad, the first one I ever had. I've been meaning to post it ever since I posted Broccoli Salad - A High-Protein Version, where I tell the amusing story of one of his rare forays into the kitchen. Years later, after my mother died, he did learn to make a few things. 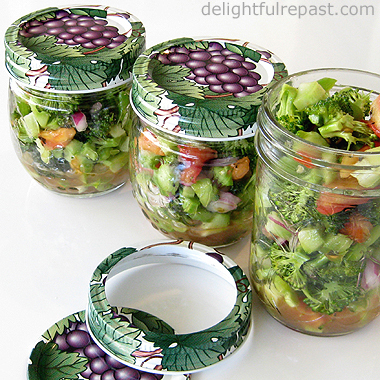 Note: As you can see, it's a perfect picnic or lunchbox salad, individual servings easily transportable in half-pint jars. This salad was something he started making huge batches of anytime he was expecting anyone to come stay with him for a few days. He would just get out his biggest stainless steel bowl, which held at least 6 quarts, and start chopping stuff up until it was filled to the brim. We'd have to eat it at every meal until it was gone, or he'd say "I thought you liked broccoli salad"! One time we stayed five nights, so we had it at nine lunches and dinners! It was a good thing we liked it because I can eat something once just to be polite, but nine times? This was the first time I've made it since he died. I feel a little rebellious writing this because he was such an introvert he wouldn't have liked being written about on the internet! 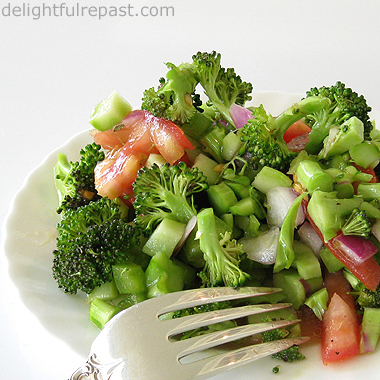 This broccoli salad is a non-creamy, vinegar and oil, "Italian" dressing kind of salad, unlike the other one which has more ingredients and a creamy dressing with a touch of sweetness. Which kind do you prefer? I like both. Oh, at some point I'll have to tell you another salad story--one where Daddy refused to eat "that damn hippie crap"! * Yellow would have been lovely, but the yellow bell peppers were imported; so, of course, I bought the more "local" green ones. 1 In 2-quart bowl, combine chopped vegetables. Aim for 1/4-inch dice on the broccoli stems and bell pepper. 2 Add the remaining ingredients directly to the bowl--no need to make the dressing in a separate bowl. Stir until well combined. 3 Cover and chill for at least 4 hours or overnight. After a couple of hours, give it a stir and taste and adjust seasoning.